Cruising the woods for a Vista. 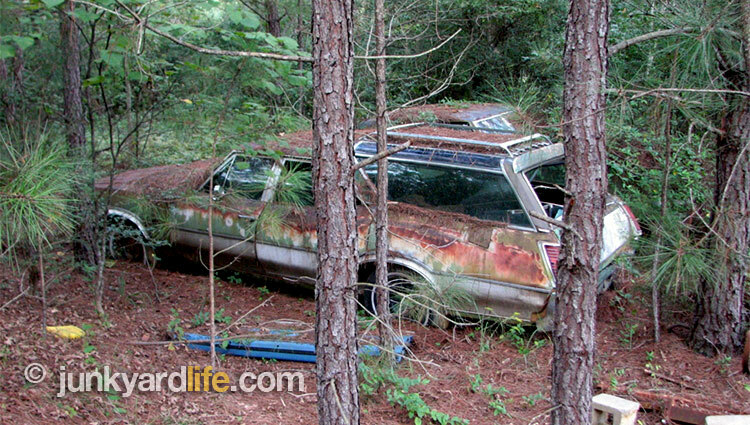 Finding a 1970 Vista Cruiser in the woods is unlikely. Our dream wagon viewed in the wild. Would you brave nature for a rare Oldsmobile wagon? We would! We did! 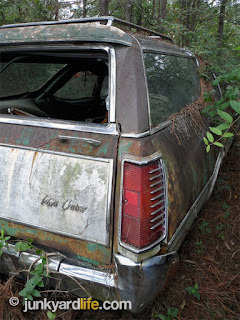 It was indeed a Vista Cruiser that I dubbed “The Green Wagon of Green Envy and Green Ivy” during our deep woods exploration in Georgia. One glance, and the unmistakable mirrored-glass roof, had us charging through the trees for a closer look. 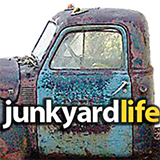 It has been noted that, apparently, Junkyard Life spends a lot of time in the woods. Our adventure-prone staff of car dorks really pay our dues to do what we love. I (Ron) don’t mind the potential snake sighting, but hate the heat. Anthony hates snakes, but does not mind the heat. Jody tolerates the heat, but seems to attract ticks and mosquitoes. Keith isn’t thrilled about either extreme temperature and has a talent for finding sticker bushes and briers. We would endure all of that and more for a chance to crawl around a cool Vista Wagon like this one. Covered in mounds of pine straw the shiny roof rack gleams like a crown atop the 1970 Olds Vista Cruiser. 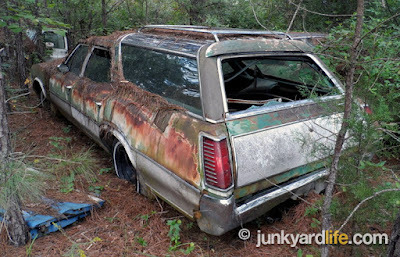 There is a lot to notice on this 1970 Oldsmobile Vista Cruiser. First up, this weathered wagon is in the woods. Here we are again! 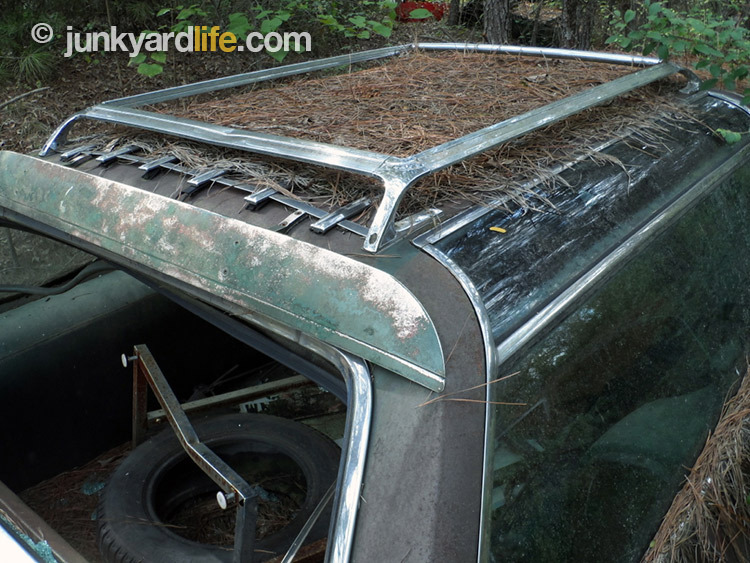 After applying a large amount of insect repellent we begin to dive into the details that once made this wagon a little special. Our Vista radars picked up on the famous roof glass from a distance. We absolutely love these roof lines and everything about them (see fun facts). The seeing part only got better from there. That is the seeing and not the smelling. Something died under, or very near, this awesome wagon (what a way to go!) and it let us know with quite a stench. Shoo-wee. 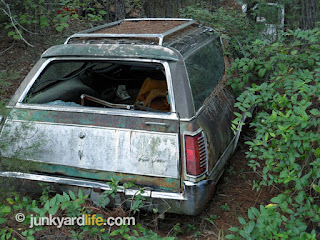 Ron Kidd surveys his dream ’70 Vista Cruiser wagon in the woods. A quick way to tell this is a 1970 model is the tail lights. The “tell tail” sign is the tiny silver trim on the ridges. A classy touch indeed, and highly sought after by us Vista guys. Next, take note of the way cool rear air deflector. Darn it, another thing we Vista guys want. Stay tuned to Junkyard Life for a future investigation on what these rear spoilers actually did. Were they to fend off toxic exhaust fumes to allow fair weather cruising with the rear window down? Was it a wind noise thing? Was it purely aesthetic? An odd color combination to be sure. The Vista wears light green paint with dark green interior. Add the wood grain and this combination was a surefire winner when new. Also, 1970 models had a better chance of having a 12-bolt rear with the optional limited-slip differential. I have noticed that most of the 12-bolt Olds units were not posi-traction. Judging from the host of other options, this had to be a 455-powered beast. This wagon is packing quite a list of options. Despite the stench, we did get close enough to confirm a couple of things that made us jealous. Power windows! Most Vista Cruisers came with a power rear window. That usually means one power window and four more with manual cranks. Not in this case! Buzz me up-buzz me down. Those rich folks…must have been a hefty price. Next on my jealous Vista guy list is the cruise control. 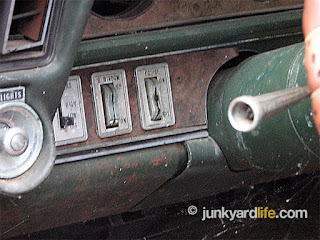 The power switch was mounted on the lower dash beside the power rear window switch. We could only take quick oxygen-deprived mini glances at this wagon, but judging from this picture, surprisingly it did not have a tilt column. Cruise control, but no tilt wheel? Well, ours doesn’t have those either — yet. See the power window switch? The vent windows were still manual. I am inclined to believe that power vent windows were never a thing on Cutlass or Vista wagons. 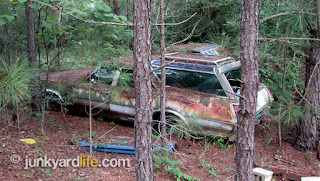 So once again, Junkyard Life takes to the woods and returns with a camera full of fruitful bounty. Inspiration to move forth on our own 1972 Vista wagon project was found. We love station wagons and we adore Oldsmobile’s entry into the mid-size wagon market with their almost exclusive window glass. This hefty classic could have been taken over the scales, but has evaded the crusher. Hopefully, someone like us will acquire it. Someone very much like us. Okay, actually us. We can hope. The first Olds Vista Cruiser wagon was introduced in 1964. It was a huge hit – adding a sporty feel to a family car. The Vista Cruiser was among the first station wagons to have a forward facing third-row seat. Noted for safety reasons, this was a plus for parents. But more fun for children, as they liked the rear facing third seats to help with shenanigans. The Vista Cruiser was so named because of the famous roof glass. The word “vista” means view. There was one other wagon GM offered with the Vista Glass – the Buick Sport Wagon. However, the run on Buick was cut short by two year models when they discontinued the Buick Sport Wagon in 1970. Even though the Vista Cruiser was technically still in production after 1972, wagon enthusiast tend to get less excited because 1973 and later Vista Cruisers did not have roof glass. An elusive option, most often found on 1972 wagons, is the mirrored roof glass that deflects heat. Reproduction roof glass for Vista Cruisers at this time is not being reproduced and owners get very nervous in storms. The Vista Cruiser has been a Hollywood favorite. The way cool wagon has made appearances in several TV shows and movies: The Fall Guy, The Richie Rich Movie, That 70’s Show, Swingtown, and Miss March to name a few. Most Vista Cruisers came with the Dual-Action tailgate. 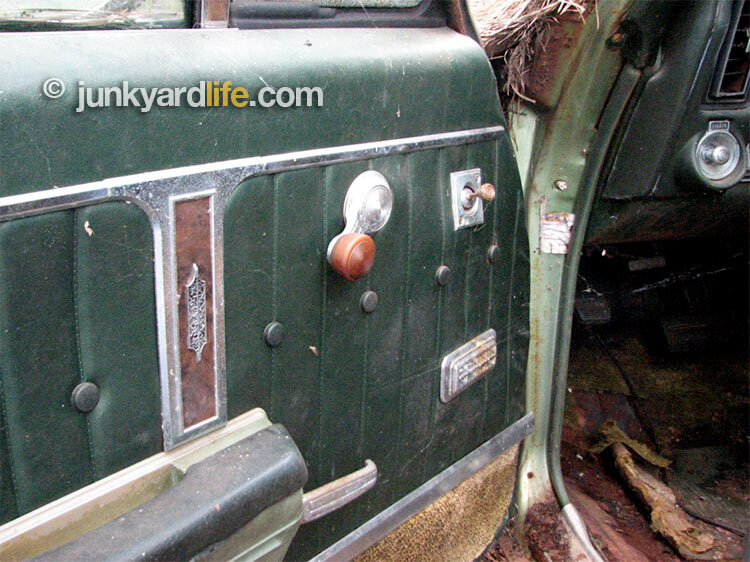 This cool option allowed the rear door to swing open like a door, or to fold flat out, like a tailgate. It even had a special section of the bumper that opens to allow the user to have a step to access the optional roof rack. Sitting in the middle seat of a Vista Cruiser is a treat. The combination of the rear roof glass and the Vista window give you the feeling of having no window at all and a great view of the world on a clear night. 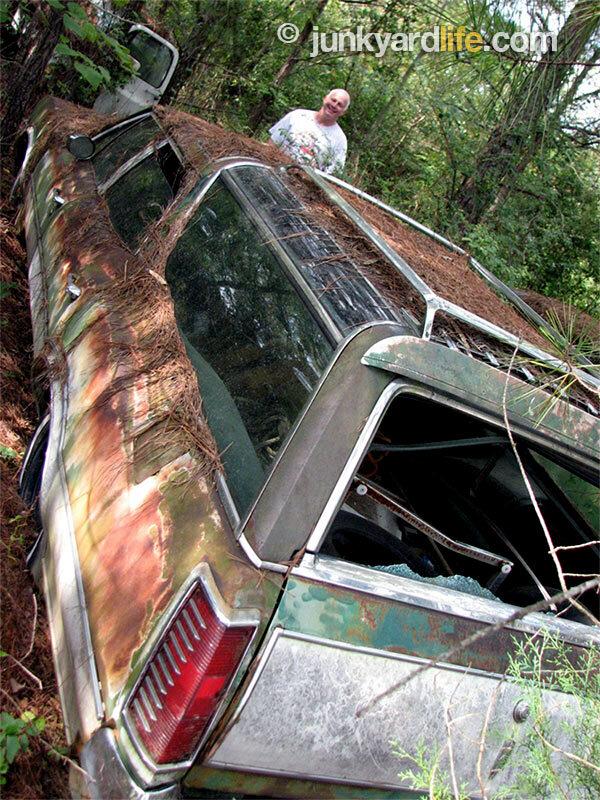 The ’70 Olds Vista Cruiser was among dozens of Oldsmobiles that the owner had collected on his property in Georgia. The rear bumper has a hidden step that opens to allow the user to step up to access the optional roof rack. 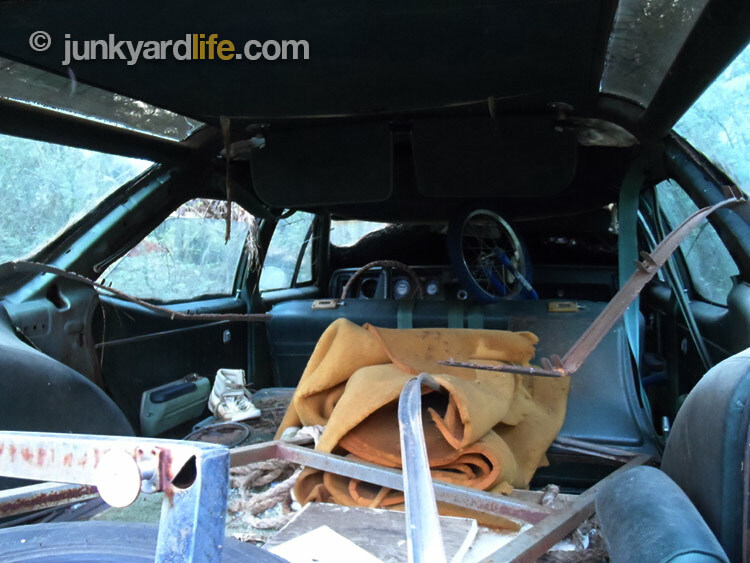 Windows abound from inside the rear of the 1970 Olds Vista Cruiser.